This set consists of 9 handpainted Desert-themed terrain Tiles. These 30cm x 30cm (1'x1') Tiles connect magnetically and can be configured to create any Desert board. You can arrange (and expand) them to simulate multiple battlefield layouts to fit any size of playing area, to suit each of your games. And, since they take up minimal space, you can store them in a small living-room cupboard. The "Tatooine" set is designed to accommodate Star Wars Legion skirmishes set in Desert planets. The Set can be augmented with 3 "River" tiles (they substitute 3 "plain ground" tiles) to form a drybed stream crossing the battlefield. 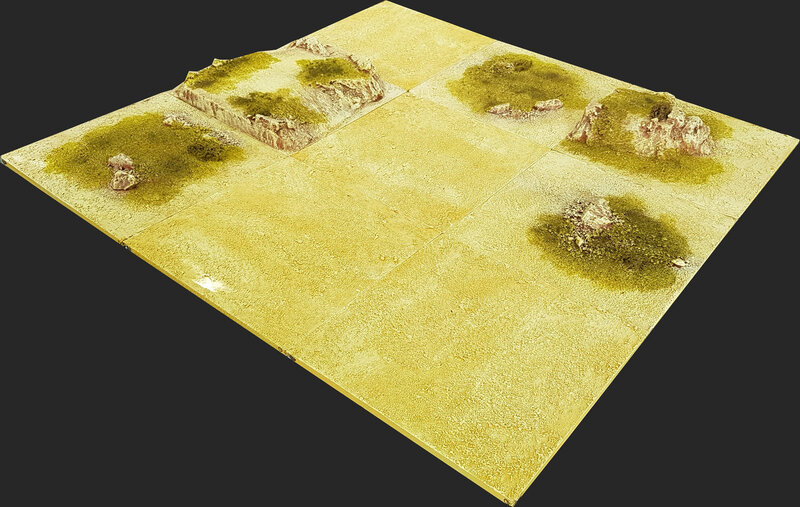 Also, you can add some extra resin Desert Rock formations to place anywhere on the board. Not in stock - this is the pre-order the Pedion "Tattoine" 3'x3' Desert Battlefield Set. to be hand crafted and painted to fit your order. See estimated delivery time. Each Tile is 30cm x 30cm (1' x 1') and 1cm deep; the majority are made from polystyrene and PVC, with Resin extra pieces. This pre-order includes a bonus addon of a bag of Pedion Desert Flock, to base your miniatures. Great for Skirmish, Star Wars Legion, Age of Sigmar, Kings of War, Frostgrave, Bolt Action, Flames of War, Warhammer 40K and Runewars wargames, as well as Dungeons & Dragons and other role playing game sessions. Miniatures and buildings shown for Scale purposes only.